Hallie Thome dribbles into the paint. Michigan’s freshman center scored 22 points and dominated inside against the Wildcats. In recent losses, Northwestern’s defense has struggled to contain elite guards like Minnesota’s Rachel Banham and Maryland’s Shatori Walker-Kimbrough. On Tuesday, however, it was the tallest player on the court that gave the Wildcats fits. Michigan freshman center Hallie Thome dominated the paint in leading the Wolverines (17-11, 9-8 Big Ten) to a 70-65 victory over NU (15-14, 4-13). Thome finished with 22 points, repeatedly scoring with ease against Cats freshman forward Pallas Kunaiyi-Akpanah. The Wildcats did a solid job against Michigan’s leading scorer, guard Katelynn Flaherty, holding her to 17 points on 4-for-15 shooting, below her season average of 22.3 points per game. Instead, it was Thome who shouldered the scoring load. NU badly missed the interior presence of graduated center Alex Cohen, who stands at 6 feet 5 inches just like Thome. Without her, the Cats were forced to defend Thome with 6-foot-2-inch Kunaiyi-Akpanah and 6-foot-1-inch junior forward Nia Coffey. Ultimately, it didn’t matter which of the two forwards tried to stop Thome, as both were unsuccessful. She hit 8 of her 11 shot attempts and got to the free throw line on four separate occasions. Thome used her size advantage and length to get open layups and score easily on post moves. To go along with her scoring, Thome chipped in four rebounds and one blocked shot. However, her presence commanded most of the Cats’ attention on the glass, which often left Michigan’s other players open for rebounds. The Wolverines finished with a commanding 42-27 edge on the boards, including 17 offensive rebounds. McKeown said an unusual trait for a post player helped make Thome so tough to stop. “She’s left handed, (which) sometimes just keeps you off balance,” McKeown said. Despite both of NU’s forwards showing an inability to defend Thome one-on-one in the post, the Cats almost never sent a double team to force her to pass. McKeown said he couldn’t afford to double her because of how talented Michigan’s shooters are. The Wolverines are second in the Big Ten in 3-point field goal percentage, making over 39 percent of their shots from beyond the arc. 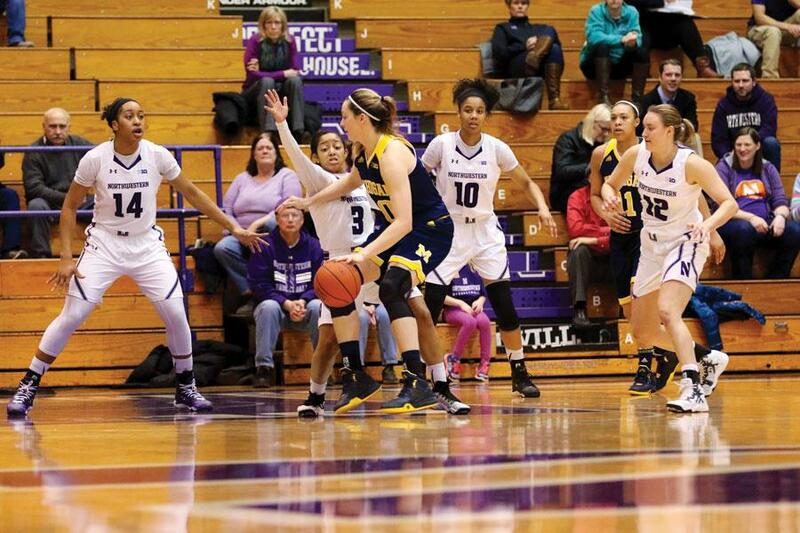 Without a second defender to slow her down, Thome continued to be a force down low in the fourth quarter, helping Michigan put the game away. She scored eight of her 22 in the final period, hitting a number of crucial layups when NU was attempting to mount a comeback.